A lot of users agree that these low-top basketball shoes from Jordan have great traction. Commenters feel the same about about the Jordan CP3.11. The Superfly 2017 Low is equipped with the React cushion, which is among Nike’s most advanced. A good number of wearers are happy with how these Jordan basketball shoes look. This shoe is true to size. Some wearers say that the low version of the Super.Fly 2017 feels comfortable. Reviews are quite inconsistent as far as Super.Fly 2017 Low’s cushioning system is concerned. There are a lot who say that the React foam is responsive without sacrificing court feel. However, a considerable number also say that it does not perform so well. Just like the Nike Hyperdunk X, some users say that these Jordan basketball shoes aren’t really for those who have wide feet. A couple of buyers are complaining that the shoes started ripping after a few weeks of use. At least one commenter is saying that these basketball shoes are uncomfortable. The Jordan Super.Fly 2017 Low seems like a very good shoe in terms of traction. One expert reviewer compares it to the Hyperdunk 2017, which for him is just one of the best basketball shoes ever created. There are issues, however, with how the cushioning works. While there are those who say that the cushion is OK, several insist that the React foam does not deliver as expected. The Jordan Super.Fly 2017 Low cut [...] needs to get more known [...] because this shoe is really awesome. From opening tip-off until the final buzzer, the Jordan Super.Fly 2017 Low helps you take control of the game. These Jordan basketball shoes utilize Nike’s latest cushioning technology that allows you to go further and play harder. The Super.Fly 2017 is cut low for a better range of motion. It features a lightweight Flyweave upper for comfort and breathability while the Nike React technology provides an exceptionally smooth ride as you dominate both ends of the floor. Cushion. These Jordan basketball shoes boast of Nike’s latest cushioning innovation. The lightweight and ultra-responsive Nike React foam cushioning technology offers ultimate energy return for an incredibly smooth and stable ride. The podular design of the midsole utilizes an Injected Phylon (IP) foam carrier that provides targeted support for enhanced stability. Traction. 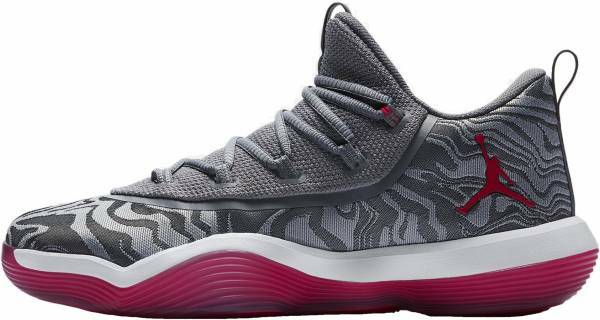 The Jordan Super.Fly 2017 Low has a durable rubber outsole that includes a multidirectional traction pattern. The pressure-mapped outsole delivers targeted grip for increased on-court traction. Length and Width. Retailers are advertising that the Jordan Super.Fly 2017 Low fits true to size. Buyers are suggested to order their normal shoe size. If at all possible, it is still best to try these basketball shoes in-store before purchasing. Lockdown. The Jordan Super.Fly 2017 Low features a Flight Web lacing system and a seamless bootie design. The lacing system stabilizes the foot for a secure and locked-in feel while the shoe’s internal bootie construction provides a sock-like fit. A synthetic leather heel with anatomically designed internal padding enhances stability and overall comfort. The Jordan Super.Fly 2017 Low has a Flyweave upper construction that is designed to wrap the foot and provide 360-degree comfort. Constructed with either engineered mesh or premium suede, the lightweight Flyweave upper offers breathable support and durable comfort. The Super.Fly 2017 Low also features an integrated tongue that offers a seamless and comfortable feel. These Jordan basketball shoes have a low-top silhouette that works well with anything you wear off the court. Its slip-on construction allows for easy on and off while its premium suede upper offers a premium look and feel. Completing the Jordan Super.Fly 2017 Low’s design is a unique pattern along its mudguard and the Jumpman logo on the lateral side of the heel. The Jordan Super.Fly 2017 Low is available in a variety of eye-catching colorways. It comes in White/Black/White, Wolf Grey/Cool Grey/White/University Red, Black/Black/Metallic Gold, Black/Infrared, and Black/Hyper Royal.